A friend of mine recently had a minor emergency when a portable hard drive was knocked off a table and ceased to function. I was called in to help. Indeed, it did not work. When plugged in (and I tried on multiple computers and operating systems), it wouldn’t be able to recognize the device. Since there was nothing I could do externally, I opened up the case, careful to make sure that anything I did could be undone. The case wasn’t even screwed together; it was two pieces of plastic that snapped together. After unsnapping all the way around, the hard drive was exposed. Again, no screws. It was held fast with some rubber strips on the corners. There was a piece of aluminum foil covering the electronics, so I carefully peeled that back. Glancing at the board, I didn’t see anything wrong immediately. The board was attached to the hard drive, and was easy to pull off. It turned out, the hard drive was a standard SATA connection, so I turned off my computer, plugged it in, and turned the computer on. It had no problem recognizing the hard drive and mounting it. I created a folder on my computer and immediately copied all the files over without any problems. Next I compared the file sizes to make sure I had gotten all the files and they added up to the right size. After that, I turned off the computer and removed the hard drive. Looking again at the board, I noticed a small part near the USB connection that was askew. 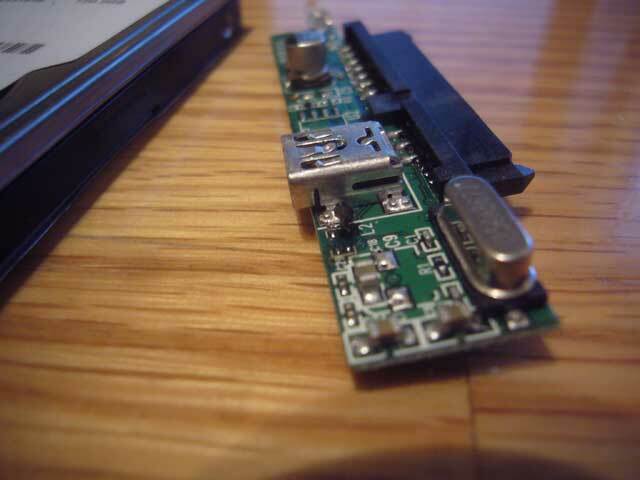 Looking more closely, it was indeed broken off the board and hanging by only one of the four solder points. The board was so small, though, and the connections tiny. I tried heating up the soldering iron and getting in there, but there was no way I’d be able to resolder it on. Just too small. I told my friend the data was fine and that the board was not and that if she got another portable hard drive I could copy the files over to it. She brought me a new portable hard drive, so I plugged it in, copied the files, checked the size to make sure it was all copied, and unplugged it. Then I brought her the new hard drive, the old one, and showed her the parts and what had happened. Since the hard drive was still good, it didn’t make sense to discard it. It’s a 120GB laptop hard drive. She’s going to confirm that everything is there, and then I’ll delete the copy of the data I have on my hard drive. The whole operation was surprisingly easy, and it certainly helped that the portable hard drive was so simply designed and used standard connections. I’m glad we were able to recover everything, though a little disappointed I couldn’t resolder the part back on.